Chances are you really enjoy spending time interacting on social media. After all, if you didn’t you probably wouldn’t be here. So now you have an exciting vacation planned and you are really looking forward to sharing it with all your friends. You plan to hit the beach or maybe the mountains. Enjoy that tropical drink under a little umbrella or maybe a campfire under the starlight. You plan to document the entire trip with your smartphone and share it with the world. Wait a moment and think about this before you post. Lets think about the issues. 1) Do you really know all your friends and their friends? I would bet not, so rule number one is to assume that anything you post will be seen by everyone (and I mean everyone) in the world. If you follow that rule and let it guide your posting you should be fine. 2) Do you want everyone to know that your home is empty while you are out of town? There are people in this world looking for an easy target so don’t post when you will be out of town. Announcing to the world that the house is empty will lead to problems. 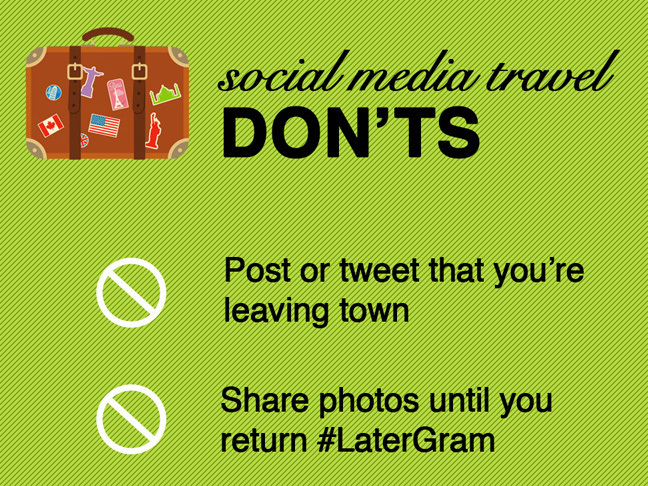 3) While you are on vacation refrain from posting pictures of you traveling everywhere. Everyone loves that beach sunset shot, but leave it on the phone until you get back in town. Then post away. But don’t post it while you are on vacation. 4) So you have ignored everything I have said so far and decided you had to post. Don’t tag your friends in your vacation pictures. Even though they may have joined you on the trip doesn’t mean they want the world to know they are away. They may have heeded my words of advice only to end up tagged in your shot. So please be careful on who is in your shots. 5) Would you ordinarily post pictures of your young kids? Letting your guard down while on vacation is not a good idea. Remember everyone in the world is looking at your pictures and it only takes the wrong person to remember your little girl’s name, put that together with information from your profile, and suddenly this stranger sounds like they are one of your friends. Be careful. 6) Don’t ever post anything derogatory about your job. Yes, we all love vacations, and yes we all like to unwind, but keep those negative thoughts and comments to yourself. Remember, everyone is looking at your posts including coworkers, friends of coworkers, bosses, etc. Nothing positive will come of negative work-related venting over social channels. Go and enjoy your well-deserved vacation, but remember that everything you post on social media will be seen by everyone, good and bad, in the world. Think before you post. It is always safer to wait until you return home and then relive those wonderful times, and post your favorite photos from the trip. Check our great home inventory.